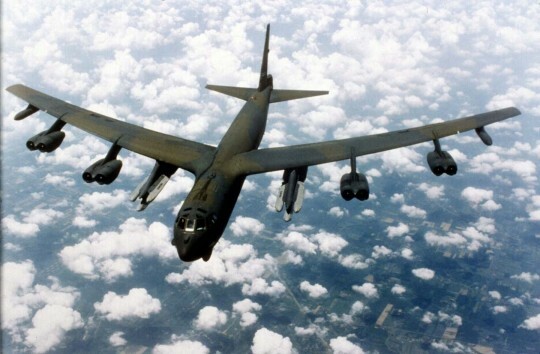 The U.S. Strategic Command, which is in charge of waging nuclear war, will hold large-scale bomber exercises this week—days after Russia held what Moscow called "massive" war games simulating a U.S. and NATO nuclear attack. The purpose is to "demonstrate flexibility and responsiveness in training scenarios throughout the continental U.S.," the command said in a statement from its Offutt Air Force Base, Nebraska headquarters. "This exercise provides unique training opportunities to incorporate the most current technology and techniques in support of our mission," said Adm. Cecil Haney, Strategic Command commander. "Continued focus and investment in our strategic capabilities allow US Stratcom to deter, dissuade, and defeat current and future threats to the U.S. and our allies." Global Lightning, planned for more than a year, will began days after Russian President Vladimir Putin last week oversaw what Russian defense officials called a "massive" nuclear war drill that simulated U.S. and NATO nuclear attacks. Stratcom said in its statement, in an apparent reference to the Russian war games, that "the timing of the exercise is unrelated to real-world events." Tensions remain high between the United States and Russia over Moscow’s military annexation of Ukraine’s Crimean peninsula and ongoing pro-Russian unrest in eastern Ukraine. Defense Secretary Chuck Hagel on Sunday declined to categorize Russia as an enemy, despite its aggression in Ukraine. "We're not at war with Russia, so do define an enemy as being at war or not at war?" Hagel said on ABC’s This Week. Russia is "an adversary in Ukraine, sure," he said. "But I think that's a little simplistic to get into either enemy, friend, partner, so on," Hagel said. "Russia continues to isolate itself for a short-term gain. The Russians may feel that somehow they're winning, but the war was not about just short term." U.S. officials have said some 40,000 to 80,000 Russian troops are deployed within a short distance of Ukraine’s eastern border. Russia is seeking to create a federated state in Ukraine as part of Putin’s announced plan to restore elements of the Soviet Union. The Russian leader regards many of the former Soviet republics surrounding Russia, including Ukraine, as the "near abroad" that Moscow wants to control. "Global Lightning 14 is designed to provide training opportunities and to test and validate command and control procedures for U.S. Strategic Command and its subordinate units," said Army Lt. Col. Stephanie Bounds, the spokeswoman. "Just as technology changes, so do the threats. This exercise provides the opportunity to incorporate the most current technology and techniques in support of our mission." The command "is constantly honing its capabilities to deter, dissuade, and defeat current and future threats to the U.S. and our allies," she said. Bounds declined to provide details of the exercise but said: "All activities are designed to test and validate command and control procedures for U.S. Strategic Command and its subordinate units." A U.S. official said the U.S. Cyber Command, part of Strategic Command, will take part in the exercises that are said to include simulated cyber attacks against Strategic Command communications and command systems. Mark Schneider, a former Pentagon nuclear strategy official, said the Russian exercises appeared intended as a political message to the West. Schneider said Russia usually holds its nuclear drills in the fall and the timing of last week’s war games "suggests to me that the intent was nuclear intimidation against NATO over the Ukraine." Moscow on April 14 also conducted a test launch of a new ICBM called the SS-27 by NATO that carried multiple simulated warheads that analysts say potentially violated the 2010 New START arms treaty. Moscow and Washington also have been battling over Russia’s plan to upgrade aircraft used in conducting permitted spy flights over the United States that intelligence officials say could undermine U.S. security. The flights are carried out under the Open Skies Treaty. Russia temporarily blocked a U.S. overflight of Russia and a spokesman mentioned the dispute over the new Russian aircraft in criticizing U.S. officials. The Obama administration also recently turned down a proposal from Russia aimed at resolving differences over U.S. and NATO missile defenses in Europe. Moscow is opposing the deployment of interceptors and radar in the region and has charged the United States with seeking to counter Russian strategic offensive missiles. The administration insists the missile defenses are aimed at countering Iranian long-range missile threats.